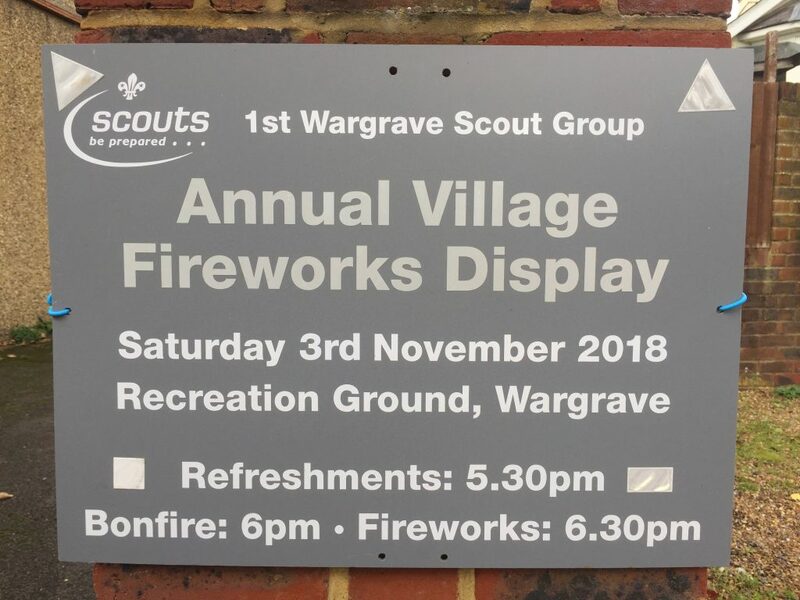 The annual Village Fireworks provided by 1st Wargrave Scouts, takes place on Saturday 3rd November. Refreshments including Tea, Coffee, Hot Dogs, Burgers, Mulled Wine and Beer will be available from 5.30pm with the Bonfire lit at 6.00pm and Fireworks from 6.30pm. This is a fantastic community event for the village, and takes a lot of work and effort to organise before, during and after. The Scouts will be selling glow sticks, profit will be donated to support Danial and Thomas both x-1st Wargrave Scouts (now Loddon Explorers) on their Berkshire Scouts Project Africa Uganda 2019 adventure. Please note there is a minimum donation of £5 per family of four payable on the gate. Sparklers are not permitted on site for safety reasons. This is our annual fundraiser for Beavers, Cubs and Scouts it requires a lot of parent participation and contribution to run smoothly and safely. Please help out where and when you can, we still have a number of jobs that could do with more hands, to volunteer please contact Lesley Hucker our Exec Chair at exec@wargravescouts.org.